South Pacific Pictures - 101 min. Cast: Keisha Castle-Hughes, Rawiri Paratene, Vicky Haughton, Cliff Curtis, Grant Roa, Mana Taumaunu, Rachel House, Taungaroa Emile. 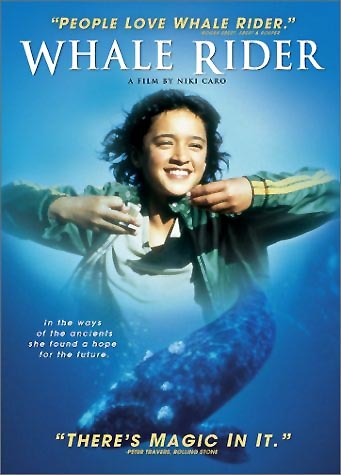 Screenplay: Niki Caro from a novel by Witi Ihimaera; Director of Photography: Leon Narbey; Music: Lisa Gerrard; Editing: David Coulson; Costume Design: Kirsty Cameron; Production Design: Grant Major; Producer: John Barnett, Bill Gavin; Director: Niki Caro. 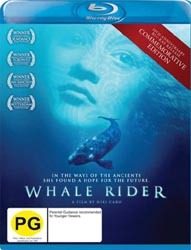 The people of Whangara believe that their first ancester, Paikea, arrived on the back of a whale. In the centuries that followed, a line of first born boys have descended from him to become chiefs - until today. Today, the tradition would fall to a girl named Pai, but her grandfather chief refuses to acknowledge her claim. Although there are a number of fine performances, it is Castle-Hughes that stands out with her determined claim. This beautifully photographed modern tale, based upon Maori tradition, should be on everyones "must see" list. Highly Recommeded. It is presented 2.32 widescreen, enhanced for 16x9 and is in dolby 5.1 or 2.0 surround English with english subtitles. R1 NTSC DVDs are available from various North American sources for about $10us. The DVD also includes extras of a directors commentary, deleted scenes(5:50), a "Behind the Scenes" featurette(27 min. ), another featurette - "Te Waka: Building the Canoe"(11.14), 5 - TV spots (2:40), Trailer (2:24), 5 audio clips from the soundtrack CD (11:47), an art and photo gallery. R2 versions are available in the UK for about 10# or in Germany for 12eur. R4 DVDs are available from various resellers for about $15nz or $10au. A special R4 two-disc set is available in Australia for $30au, which in addition to the above, includes the short film 'Cracker Bag'. An All-Regions 1080p 2.35:1 Blu-ray Edition is available from resellers in Australia and New Zealand starting 24 April 2013 and selling for about $20. It has a DTS-HD 5.1 spoken English soundtrack with an English subtitle option. The extras include a director's commentary track, deleted scenes with commentary, the featurette "Te Waka: Building the Canoe", another featurette "Behind the Scenes', Auditions and trailers. Starting 05 December 2014, a Region B 1080p 2.35:1 Blu-ray offering is available from German resellers for about 15eur. It has both spoken English and German DTS-HD 5.1 soundtracks and a German subtitle option. It's extras are the same as those contained in the afore mentioned AU/NZ Blu-ray. Starting 22 August 2017, a Region A Blu-ray($19-23) and a Region 1 DVD($14-15) will be offered in the US and Canada. It will have its original spoken English track and an optional English subtitles. Extras will be the same as those in previous releases: directors commentary, deleted scenes(5:50), a "Behind the Scenes" featurette(27 min. ), another featurette - "Te Waka: Building the Canoe"(11.14), plus poster art and photo gallery. The package will also include a digital copy of the feature. 2002 - Toronto International Film Festival - People's Choice Award.